September 2016 • SMT Magazine 73 IPC-1782 STANDARD FOR TRACEABILITY SUPPORTING COUNTERFEIT COMPONENT DETECTION Application of Standard This standard defines a template which can be used for, but not limited to: • SMT components (including discrete components) and through-hole components • PCBAs, PCBs, and base materials (laminate, glass, resin, etc.) • Connectors and switches • Cables • Mechanical assemblies and covers • Acoustic and RF components (including antennas, power amplifiers, etc.) • Software Levels are defined in the standard that de- scribe up to 16 different levels that can be ap- plied to different sectors in order that there is an appropriate balance between the detail of data collected and the cost/effort/values in do- ing so. The standard can therefore be applied in sectors as diverse as: • Mil/Aero • Consumer electronics • Medical • Automotive • Industrial • Telecom Getting Started The flow diagram in Figure 1 shows a sim- ple process used by the user to determine the appropriate levels of traceability required, both in terms of materials and process traceability, based on risk assessment. Approaches to risk analysis can vary be- tween industries and geographies. Traceabili- ty has grown from being a specialized need for safety-critical segments of industry to now be- ing a recognized value-add tool for industry as a whole. 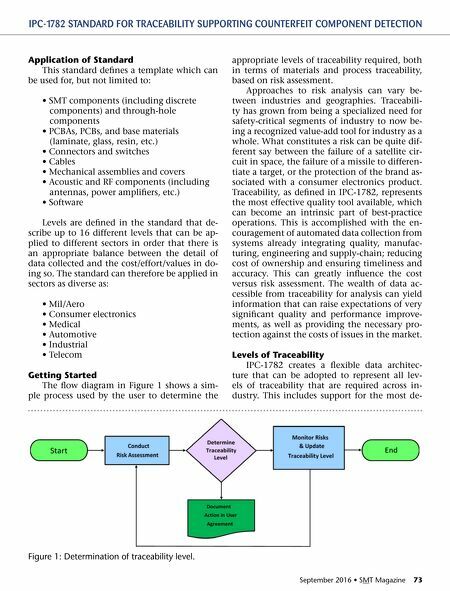 What constitutes a risk can be quite dif- ferent say between the failure of a satellite cir- cuit in space, the failure of a missile to differen- tiate a target, or the protection of the brand as- sociated with a consumer electronics product. 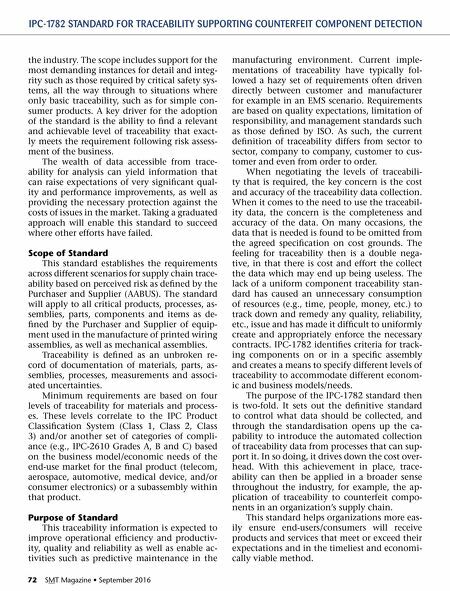 Traceability, as defined in IPC-1782, represents the most effective quality tool available, which can become an intrinsic part of best-practice operations. This is accomplished with the en- couragement of automated data collection from systems already integrating quality, manufac- turing, engineering and supply-chain; reducing cost of ownership and ensuring timeliness and accuracy. This can greatly influence the cost versus risk assessment. The wealth of data ac- cessible from traceability for analysis can yield information that can raise expectations of very significant quality and performance improve- ments, as well as providing the necessary pro- tection against the costs of issues in the market. Levels of Traceability IPC-1782 creates a flexible data architec- ture that can be adopted to represent all lev- els of traceability that are required across in- dustry. This includes support for the most de- Figure 1: Determination of traceability level.